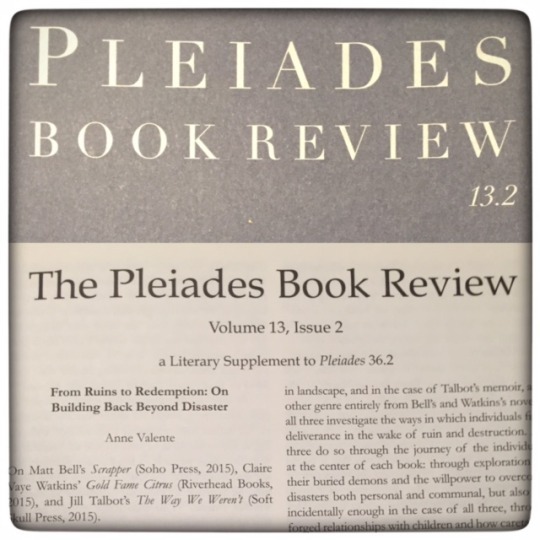 I’m delighted to have a feature review in the newest issue of Pleiades, “From Ruins to Redemption: On Building Back Beyond Disaster,” which compares and contrasts Matt Bell’s Scrapper, Claire Vaye Watkins’ Gold Fame Citrus and Jill Talbot’s The Way We Weren’t. Though the former two are novels and the latter a memoir, all three grapple with the question of how one moves on past catastrophe. It was a pleasure to read and analyze these three excellent books, and I’m grateful to reviews editors B.J. Hollars and Brett Beach for publishing this review! It is a gorgeous issue and I’m so thrilled to be a part of it.